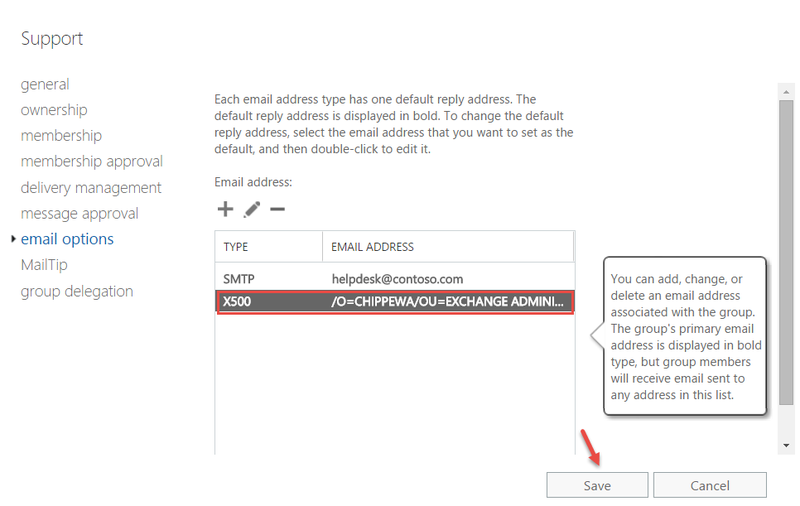 While SMTP addressing is the de facto e-mail addressing standard, Exchange internally uses an X.500 addressing scheme and not SMTP. 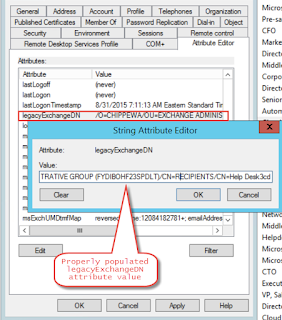 Using X.500 implies that an X.500 is required, which is why mail objects in an Exchange organization such as mailboxes, require a properly populated legacyExchangeDN AD attribute. The most encountered symptom of not having properly populated or unpopulated legacyExchangeDN attributes is failure of e-mail delivery or transport. 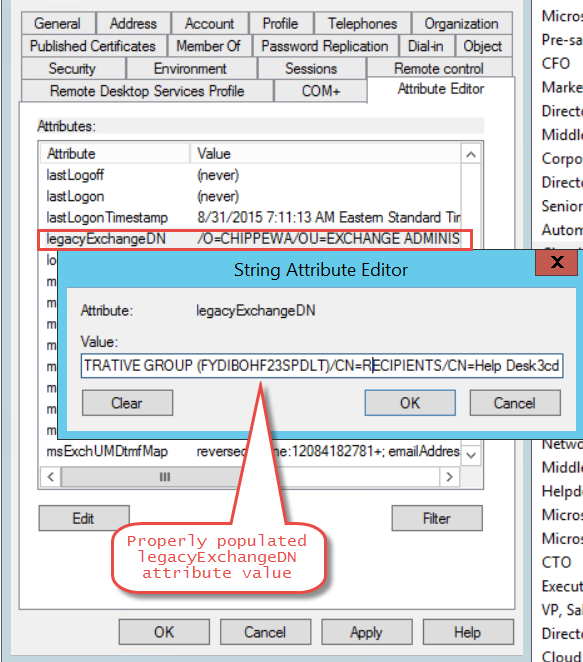 legacyExchangeDN is still required, unlike some Exchange admins I overheard a while ago when they were looking for the cause of several NDRs discussing SMTP was used so it should be ‘no problem’. This behavior is caused because every internal message send/received in the organization will have the recipient info resolvable normally to the legacyExchangeDN AD attribute. 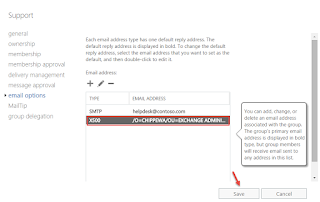 In this case, the user mailbox would have been recreated or the old legacyExchangeDN value would have been changed to a different one. 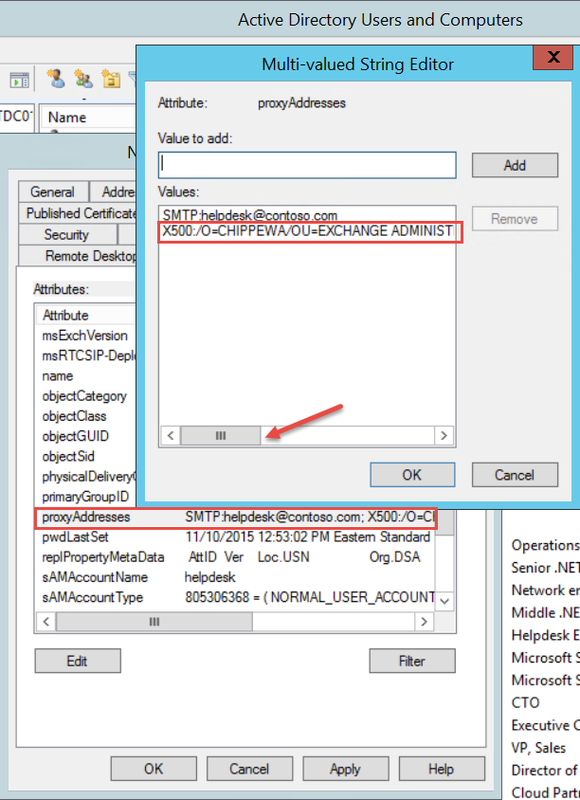 It can also happen if you tried to convert any mail recipient type to another without re-adding original legacyExchangeDN as X.500 address alias to list of proxy addresses of new mail object (I'd also recommend to save existing additional X.500 address list of original mail object if exists and move it to new mail object). There is also quick workaround for single affected client. 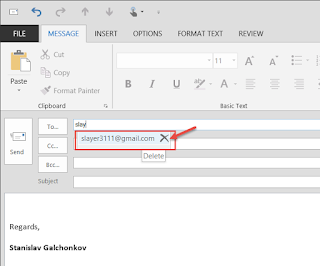 You can simply delete Outlook Autocomplete invalid record from Outlook cache or multiply invalid records using great Nk2edit utility. Just type few first letters and click Delete X in Outlook. Then try to type full address manually, send e-mail and you should be OK with no 5.1.1 NDR at this point. Again this is a workaround for single user desktop and if you still need to implement more elegant solution for every user you need to fix it on server side. 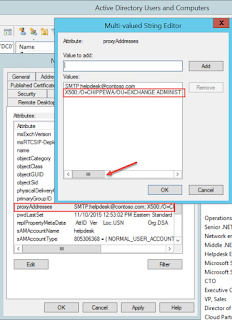 To reconstruct the X.500 address using the information from the NDR message use support article KB2807779 contains a short instruction or utilize the small interactive Powershell script below to convert the reported IMCEAEX address to an X.500 entry. $Address = Read-Host "Enter full IMCEAEX address from NDR"
$Address = "X500:$Address" -replace "IMCEAEX-","" -replace "@. *$", ""
Result will be string "X500:/O=CHIPPEWA/OU=EXCHANGE ADMINISTRATIVE GROUP (FYDIBOHF23SPDLT)/CN=RECIPIENTS/CN=Help Desk3cd".